"There is a traditional viewpoint, which tends sometimes to dictate our train of thought. Sometimes it is good to think outside of the box so to speak, hence as with this seascape section boats can be seen in any colour background – be free, loose and vibrant. In the case of the Race Day - be overpoweringly nautical"
"I don't want a photograph, it is important to me that the subject is recognisable, ie London but the size, perspective must be random to a degree, almost through the eyes of a 6 year old." "It's funny, inspiration can just sneak up and grab you unawares. On the day Louis our son was born, we were as expected on these occasions absolutely inundated with flowers of all shapes, colours and sizes. Initially I painted groups of flowers and this evolved into the big vibrant centrepiece"
"A collection of stunning greeting cards suitable for all occasions. Our cards are blank inside for your own message. Each card comes with an envelope and cellophane wrapped." "All of our coastal coasters are printed locally, easily wiped clean - no dishwashers please! Sold individually so you can mix & match as you choose. The coasters have a melamine front and felt back." "Bringing something new to the table, these glossy place mats are a great way to smarten up meal times, with a non-slip cork underside that won't scratch or mark your table. All of our place mats are sold individually and can be mixed and matched with our coasters. Available in 15 stunning designs." "These exclusive mugs are the first part of my homeware range. 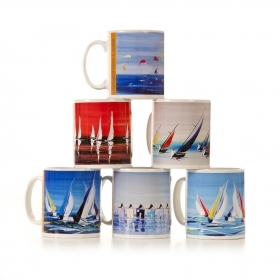 They complement any home with a nautical or coastal flavour and would make a perfect Fathers Day gift. Printed locally in Dorset. No dishwashers please!" "Worktop saver that adds a splash of colour to any kitchen or galley. Stephen's glass chopping boards feature a textured, hard-wearing surface and comes with anti-slip rubber feet. No dishwashers please!﻿"